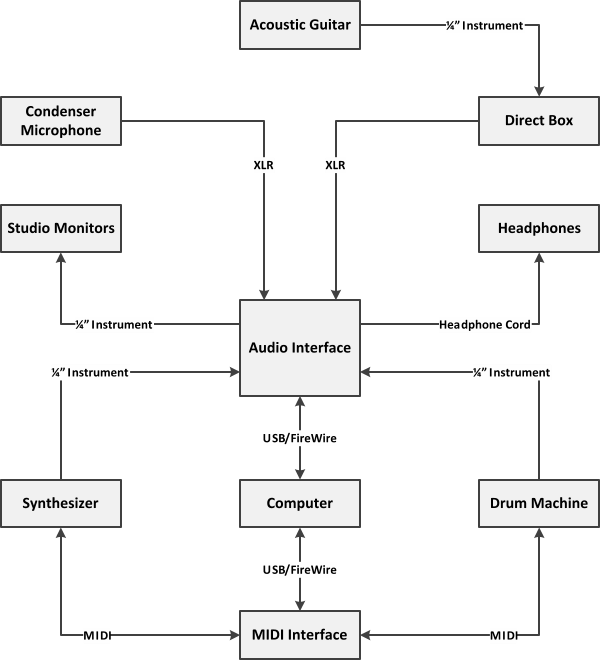 Studio Setup 8 adds the versatile drum machine to the popular keyboard, guitar, and vocals formula. This intermediate setup also includes the ability to monitor on both monitors and headphones. The main difference here is a dedicated MIDI Interface which allows you to expand your MIDI inputs. So the combination of the drum machine and keyboard MIDI necessitates the expanded input/output of the dedicated MIDI interface. With the MIDI interface you can have multiple inputs/outputs instead of being constrained to the one on your Audio Interface. This may look more complicated than what we've already covered, but it's really not.